Premium quality, fast-drying acrylic paint thinner for the automotive and manufacturing industries. The broad solvency and graduated boiling range renders All Purpose Thinners ideal for use in automotive paint and panel workshops as a thinner for acrylic paint and gun-washing solvents. Clear bright fluid with a broad range of solvency to reduce most paints. A high quality product that leaves a smooth, attractive, high gloss finish. 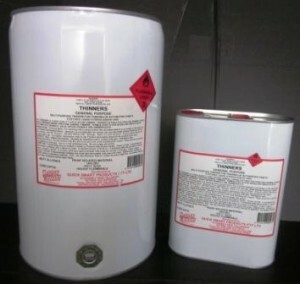 A proven all-purpose paint thinner used by many paint companies and automotive and industrial painters. Solvency – All Purpose Thinners has excellent solvency for most paints, except polyurethane coatings. Rapid drying – All Purpose Thinners dries fast to keep work moving. Quality – All Purpose Thinners helps provide a high-quality surface finish. Please consult the MSDS on General Purpose Thinners before use.